The large front lobby with the bar bistro immediately gives prospective residents and visitors a feeling of hospitality and openness. Thick timber stained wood shelves have exposed iron hardware and flanked by a clean subway tile run in a herringbone pattern. The overall cabinet color is a deep grey-blue and trimmed in a modern cut limestone. The walls take on a deeper blue-gray color allowing the traditional limestone fireplace to pop. In the background, a shiplap accent wall creates a welcoming backdrop for coastal artwork. The combination of elements results in functional and attractive spaces throughout the environment. Texas Coastal Farmhouse describes the underlining concept and style for the Shores at Clear Lake. Use of rustic woods and limestone ring true to Texas. While colors such as soft blues and grays trimmed in clean white contribute a fresh coastal atmosphere. Farmhouse themes come alive through the use of whitewashed shiplap and rustic barn doors with exposed hardware. The Shores at Clear Lake is a community with a fresh look that is both on trend and also appropriate to its location along the Texas Coastal area. 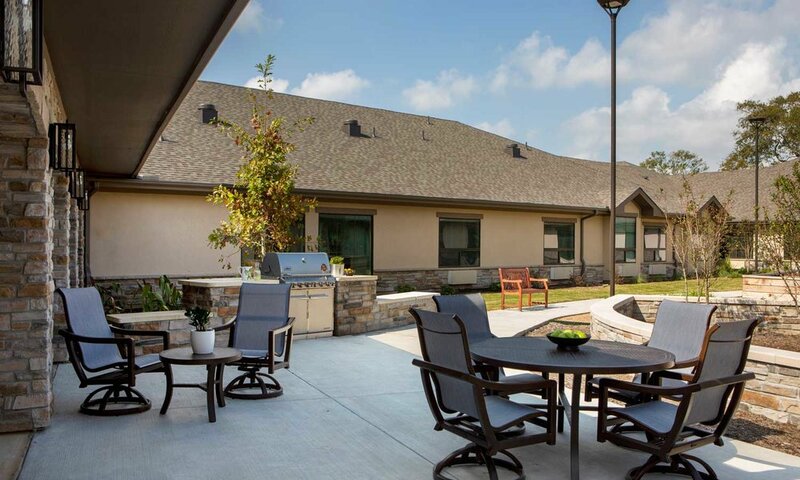 These elements interweave throughout numerous common spaces to create an attractive and comfortable home for residents. In the Bistro Bar, thick timber stained wood shelves have exposed iron hardware and flanked by a clean subway tile run in a herringbone pattern. The overall cabinet color is a deep grey-blue and trimmed in a modern cut limestone. In the near distance, one can see the rustic barn doors with exposed hardware. All these elements come together in one space, blending the Texas, Coastal and Farmhouse styles into one unique look. 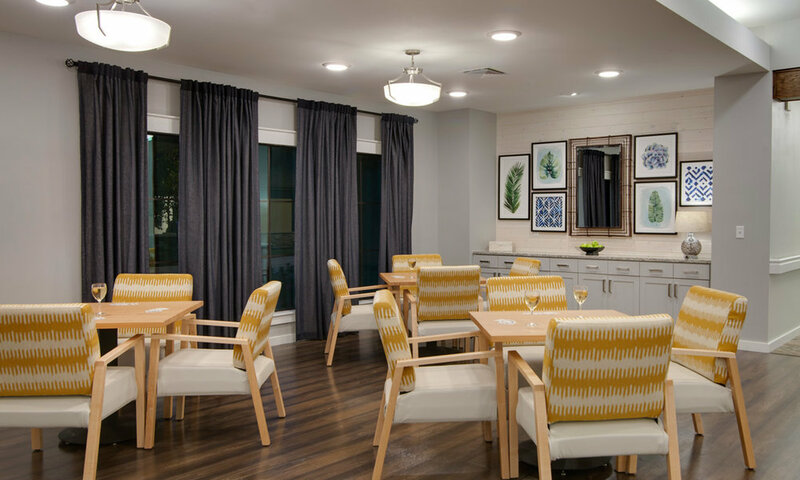 In the Memory Care Commons, the walls take on a deeper blue-gray color allowing the traditional limestone fireplace to pop. In the background, a shiplap accent wall creates a welcoming backdrop for coastal artwork. The combination of elements results in functional and attractive spaces throughout the environment. The large front lobby with the bar bistro immediately gives prospective residents and visitors a feeling of hospitality and openness. 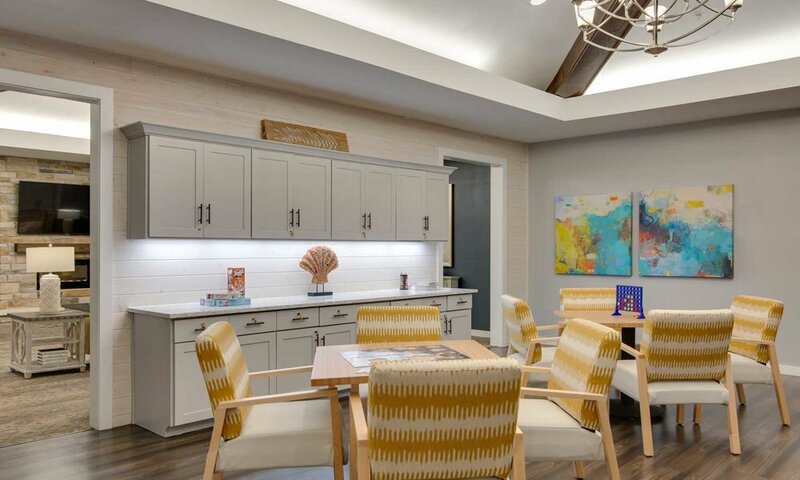 Numerous common spaces throughout from the Dining Room, Game Room, Card Room, Activity Room, Salon, and Physical Therapy Suite all combine function with style and showcase a welcoming Texas Coastal Farmhouse aesthetic.